Queen Letizia of Spain today made her first appearance after the annual summer break in Mallorca. 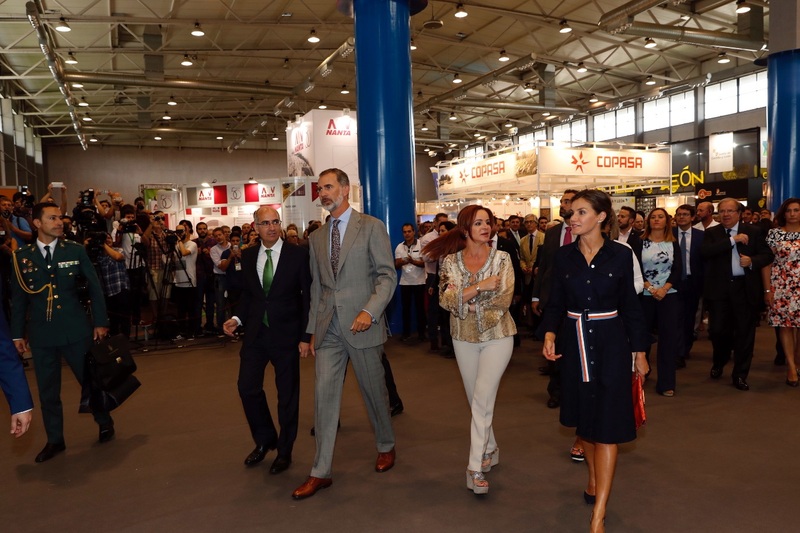 She joined King Felipe for the inauguration of “Salamaq’18” Fair of the agricultural sector and 30 expo of pure cattle at Exhibition Center of Salamanca. The 13th International Fair of Pure Cattle is taking place from September 5 to 9 in the fairgrounds of Salamanca. “Salamaq 2018” is a reference event for the agricultural and livestock sector, not only in Spain but also in southern Europe, where every years farmers and company gathered together to exhibit their products and to boost the agricultural economy. This year total 208 exhibtions will be taking place in 25,900 square meters of the commercial area of ​​the site from Spain and Portugal. The participants are 16 autonomous communities. Of the large number of exhibitors, 123 are from Castile and León (91 from Salamanca), followed by Madrid and Extremadura, each of them exceeding ten, Catalonia (9) and Andalucía (8). In addition, within the framework of the fair, the 30th anniversary of the International Exhibition of Pure Cattle is being celebrated this year also known as the cattle contests of Spain, the Iberian Peninsula and the south of Europe. 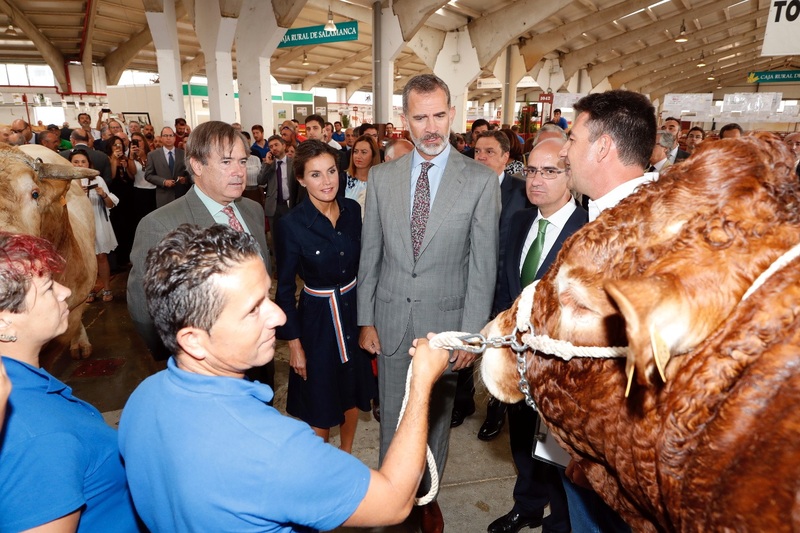 The day began with King and Queen touring the pavilions of bovine cattle in which they were species limousine, blonda, charolés and native species of Salamanca. 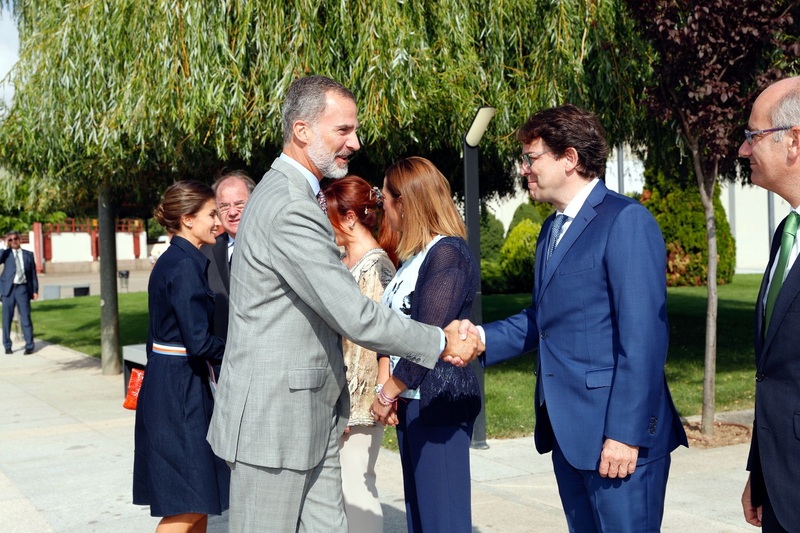 Next, they visited the exhibition area of ​​agricultural machinery and the Central Pavilion where King Felipe received a facsimile of the decree of Philip IV in which he granted Salamanca the right to organize a Franca Fair, a more remote historical antecedent of “Salamaq 2018 “. 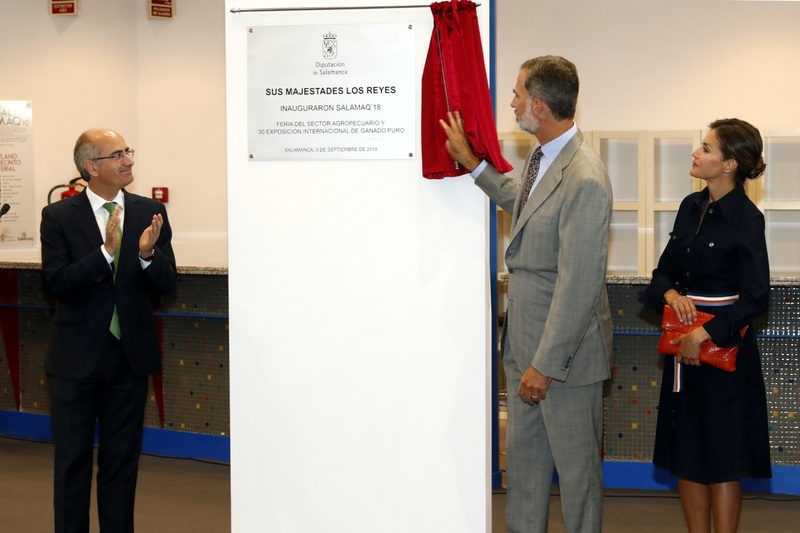 The Royal couple unveiled the commemorative plaque to mark their visit. Coming to sartorial details of the day, Queen Letizia chose to bring back an all too familiar look for her first engagement of the autumn. Letizia was wearing Hugo Boss dark blue ‘Caddli’ Stretch-denim dress that she debuted on July 2018 at the opening of Summer Music Course. 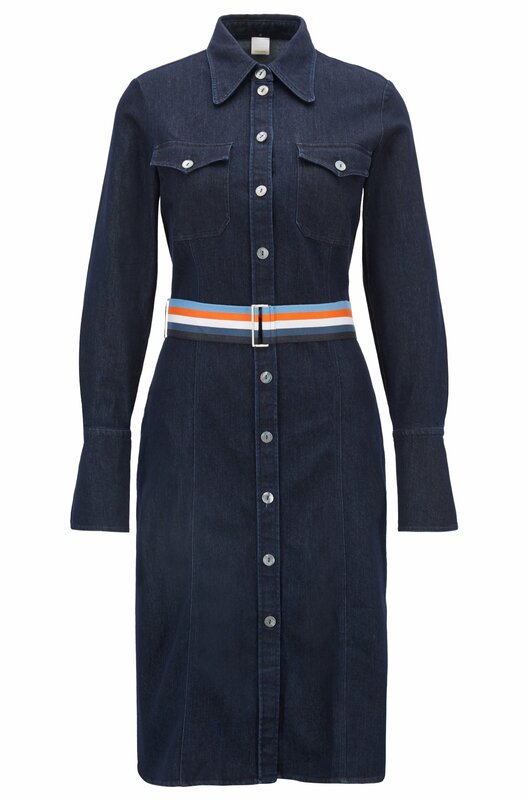 A vintage-inspired dress in indigo stretch denim by BOSS Women’s wear is cut to a slim fit features authentic details including rounded shirt collar, twin chest pockets and a front-stitched placket, playful bell cuffs, decorative buttons at the cuff and a detachable ribbon belt for a vivid pop of colour that Letizia wore inside out. 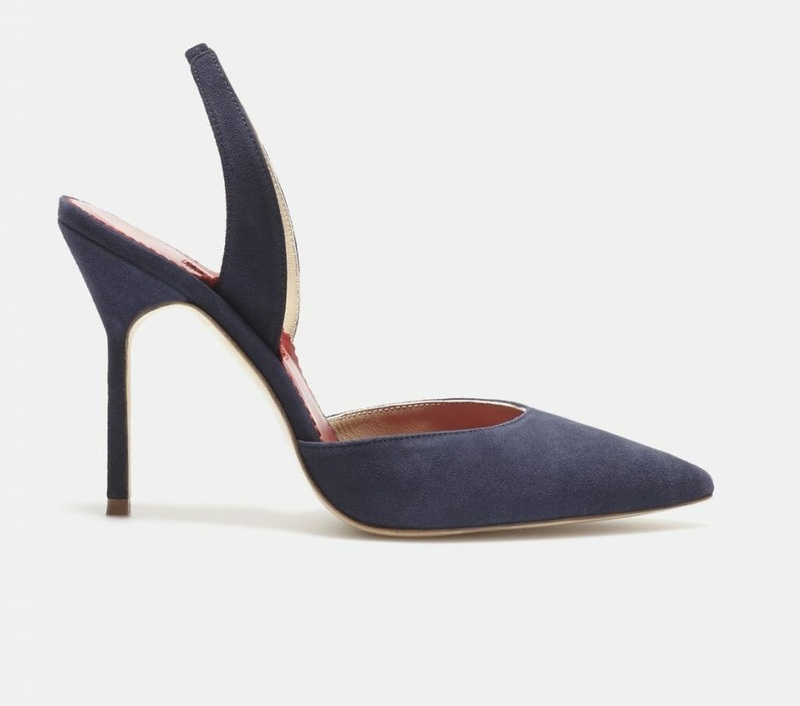 Letizia paired the dress with navy suede Carolina Herrera sandals. She has the same model in Camel also that she premiered during the audience at the palace this month. Letizia was carrying her Angel Schlesser orange croc-embossed clutch bag. 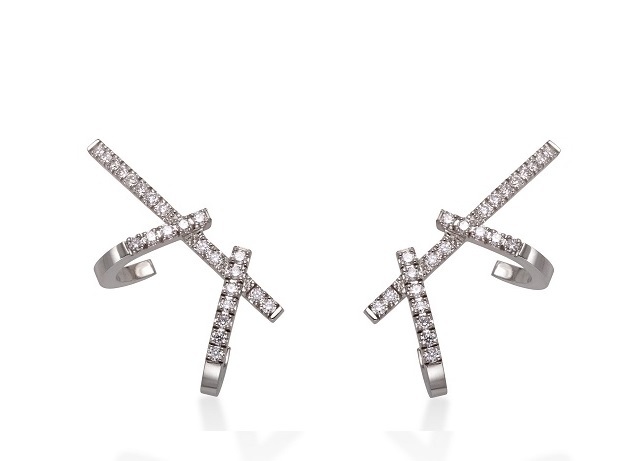 And finished her look with Gold & Roses Double Dagger earrings that she premiered in June 2017.